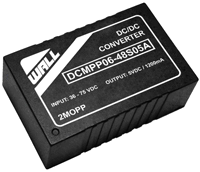 The DCMPP06 series of medical DC/DC power converters provides 6 Watts of output power in a 1.25” x 0.80” x 0.40” DIP package. This series consists of single and dual output models with 2:1 wide input voltage ranges of 4.5-9VDC, 9-18VDC, 18-36VDC, and 36-75VDC. Some features include high efficiency up to 89%, 5000VAC I/O (2 MOPP) isolation, and low stand-by power consumption. These converters are also protected against under voltage, short circuit, over voltage, and over load conditions. All models are RoHS compliant and have ANSI/AAMI ES60601-1, EN60601-1, and IEC60601-1 safety approvals. Remote ON/OFF and Trim functions are also available for this series. 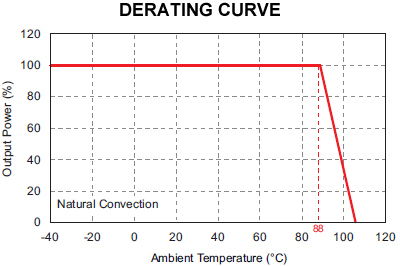 4:1 input voltage models are also available (See theDCMPPW06 series). 2. The DCMPP06 series meets EMI Class A without an external filter added. This series can only meet EMI Class B with external components added. Please contact factory for more information. 4. Remote ON/OFF control is optional and is only available for “B” type pin connection models. To order the converter with remote ON/OFF add the suffix “-P” to the model number (Ex: DCMPP06-48S12B-P). 5. 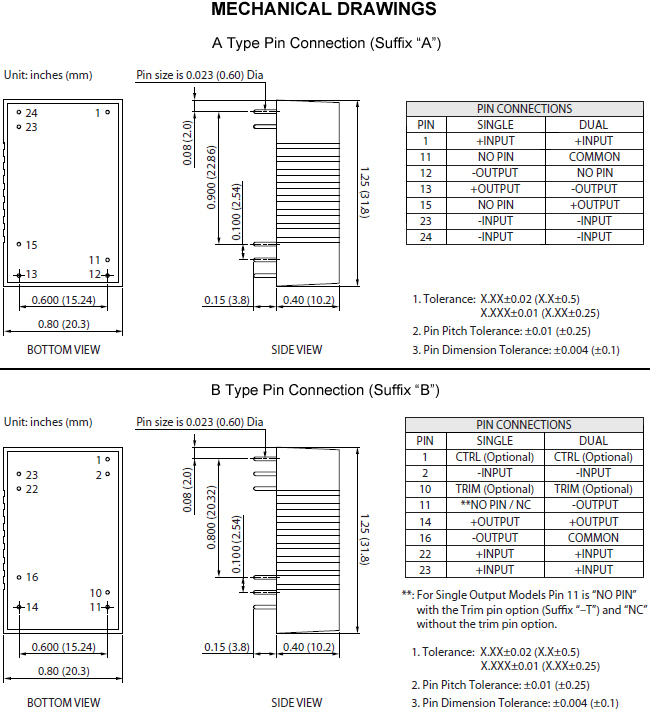 Trim function is optional and is only available for “B” type pin connection models. To order the converter with Trim pin add the suffix “-T” to the model number (Ex: DCMPP06-48S12B-T).